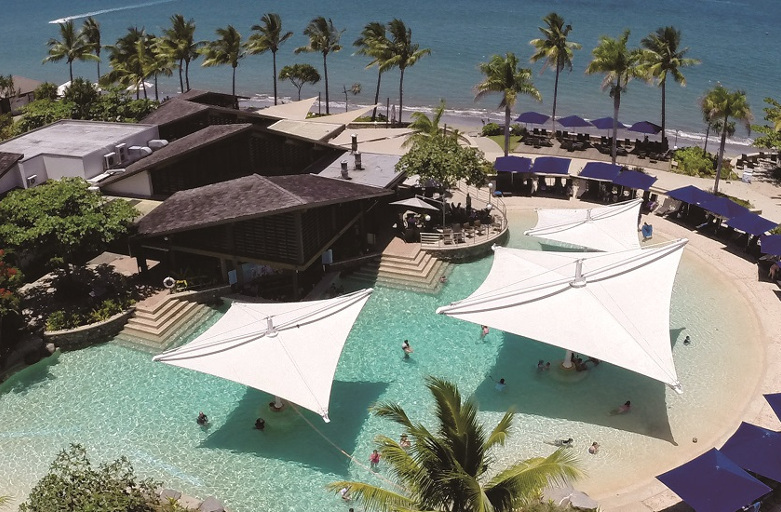 Radisson Blu Resort Fiji Denarau Island, situated among 10 acres of tropical gardens, waterfalls and a private beach. When you arrive at the Nadi International Airport (NAN), you can climb aboard our airport transfer to reach the resort in just 20 minutes. Once here, unwind in one of our spacious rooms or suites, each with a balcony or a courtyard. For further relaxation, visit our on-site spa for a massage. When it’s time for a meal, head to one of our six unique restaurants, which include in-pool dining and live entertainment. Ready for some island fun? Make a splash in our four climate-controlled lagoon pools, featuring Fiji’s only whitewater tunnel slide. While the kids enjoy activities at our Kids Club, you can practice your swing at the Denarau Island Golf & Racquet Club or go on a snorkeling adventure. If you’re planning a wedding or corporate event in Fiji, we provide beautiful indoor and outdoor venues as well as catering services and the assistance of our expert event team.